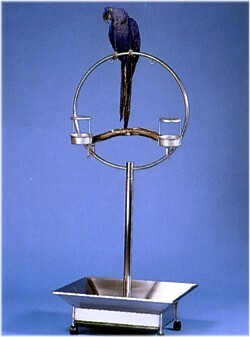 The large, 28" Ring can accommodate many bird sizes, from Amazons to large Macaws. The functional base design includes a special collection tray and apron which helps keep the area clean. Casters are included for portability. Also features built-in hardware for attaching swings, toys and chewables. Feeders are available as an option. They are specially designed with a hood centered above the dish to eliminate messing into the dish. Available in stainless steel. Overall height: 65" from floor to top of Ringstand. 11" from floor to top of Apron. 32" from Pole bottom up to bottom of Ring. Apron dimensions: W 29" x D 24". Ring is 28" in diameter.